The real Wonderland has colossal cake! Shape-shifting optional. Alice may have grown up but her cakes are still magically delicious and her tea parties slightly twisted. Well, that’s if Once Upon a Tart has anything to do with it. This quirky café is tucked away from the bustle of Glasgow’s city-centre on King Street – a refreshing new take on the average café. Bursting with colour and character, it’s enchanted forest meets welcoming city-centre hang out. Be prepared to be mesmerised by this magical wonderland. And there’s plenty of room to move – no sitting on top of your neighbour. Really it’s the perfect place to tell your dirty little secrets over something soothingly sweet and sensational. 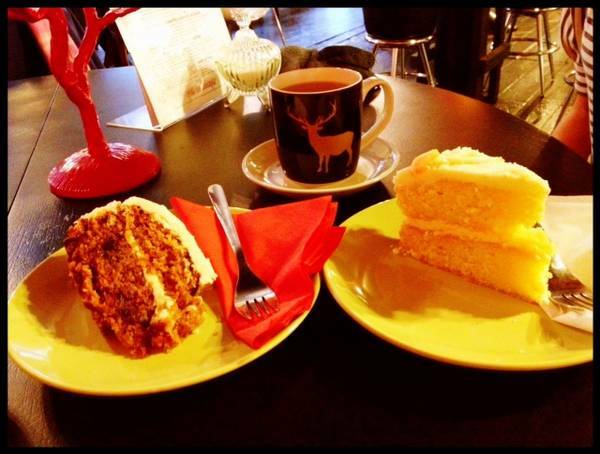 But don’t be fool because this café isn’t just a pretty place – their amazing cakes are to die for. Think of your childhood favourites, now think even better and bigger because there is no such thing as skinny slices here. And rightly so with amazing choices like lovely lemon drizzle cake, heavenly hot chocolate fudge cake and devilishly delicious bread and butter pud. And at £3.60 a pop, they’re financially guilt-free. And if none of these take your fancy – what’s wrong with you? Fortunately pernickety is catered for because there’s still waffles, porridge, scones, muffins, tarts, brownies and more to choose from. The Tart also boast a broad breakfast selection and a hearty assortment of homemade soups and filling chunky bread sandwiches. But be warned; leave a bread-crumb trail so that you can make your way back to reality. Otherwise be prepared to lose all sense of time and be happily distracted by captivating surroundings and the most delicious, giantic sweet treats. Really a great way to spend a Sunday afternoon (or any other day of the week – they are open till 5pm everyday). 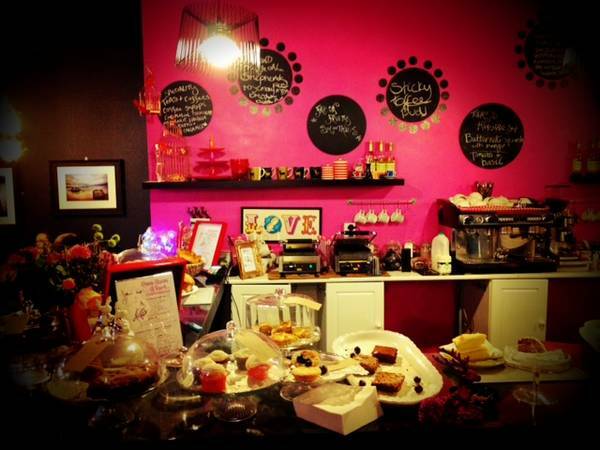 Once Upon a Tart – go for the ambiance, stay for the tremendous cake! This entry was posted in Uncategorized and tagged City Centre Glasgow, eating in Glasgow, Glasgow cafes, Glasgow food, Once Upon a Tart, what to do in Glasgow. Bookmark the permalink.